Less than 38% of the population is eligible to donate blood, but every two seconds somebody in the United States is in need of the stuff of life. Which begs the question: Why are gay men still not allowed to donate? In his documentary, Gay Positive, writer and producer Greg Dyrsten takes his story of being turned away at a blood drive to the streets of New York. If you are a man that has been sexually active with another man since 1977, you will never be permitted to give blood in the United States. This is asked in a list of preliminary questions given out at donation centers, and a dissapointing number of people are unaware of this blatant discrimination in the blood donation process. In fact, one man Dyrsten interviewed for the doc initally insisted it just wasn't true. But, can you blame him? It does sound absurd, especially considering all donated blood is tested for HIV, hepatitis B and C, syphillis, and a number of other infectious diseases before it is released to hospitals. Clearly, the antiquated FDA rule has a lot less to do with the health and safety of patients receiving blood and a lot more to do with the continuous association of HIV/AIDS with gay men, and the stigma surrounding it. The mission of Gay Positive is to bring this little-known national policy to the attention of the American public. In addition to his conversations with fellow New Yorkers, Drysten also interviews Laverne Cox, Eric Millegan, Lisa Lampenelli, and other influential LGBTQ community members and supporters. The documentrary is a project of Mattiolo Productions, which specializes in LGBTQ film and other media. Drysten is also heavily involved with Lady Peacock, another one of its films, this one focused on drag performers. 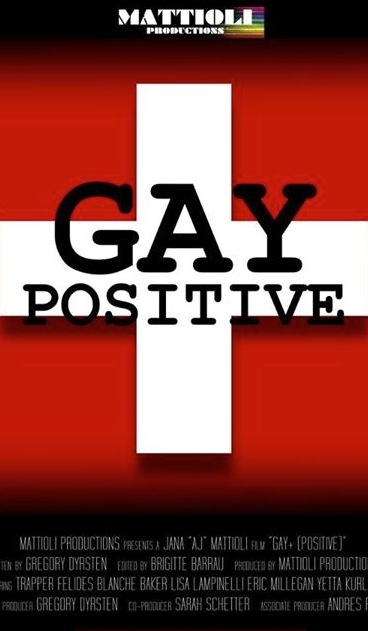 Gay Positive is currently in post-production and is scheduled for release later this year.